Performance Time: Approximately 30 mins, 33 pgs. CHILDREN’S COMEDY. 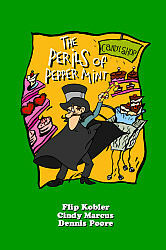 Two villains, Ginger Vitis and Dee Kay, have concocted a scheme to get rich quick by stealing a delicious new candy recipe from Pepper Mint, the owner of the Lemon Drop Candy Shop, the best candy store in the West. But what if Pepper Mint won’t hand over the recipe? Why, a villain with an evil laugh always has another plan! Muh-ha-ha-ha-ha-ha-ha! But beware! Dr. Cole Gate, Nurse Flossy, and the other citizens of Old Faithful are ready to give these villains the brush off! Children will love this wonderfully wacky Wild West show. Playwrights Flip Kobler, Cindy Marcus, and Dennis Poore run Showdown, a teen theater camp with programs in Tampa, FL, Jefferson City, MO, and Los Angeles, CA. Through their work with Showdown, they have published many plays for student actors of all ages.